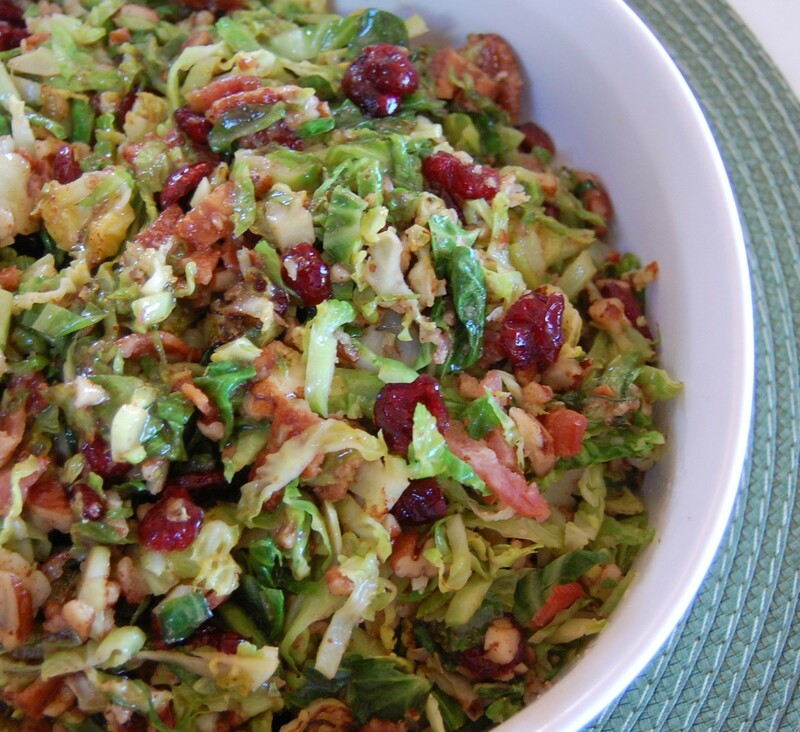 Shredded Brussels sprouts, crispy pancetta, cranberries and pecans, dressed in a sweet and tangy cider vinaigrette. Serve warm or cold. On a rimmed baking sheet, toast the pecans in the oven until fragrant, about 5-7 minutes. Roughly chop and set aside. Make the dressing: in a medium bowl, whisk the mustard, brown sugar, cider vinegar and salt. Add the olive oil, whisking to combine. Set aside. In a heavy pot or Dutch oven over medium heat, cook the pancetta or bacon until crisp and most of the fat has rendered out, about five minutes. Remove the pancetta with a slotted spoon and drain on a small paper towel-lined plate. Add the sprouts, stirring to coat in the fat. Season with salt and a generous amount of black pepper. Cook the sprouts over high-medium, until bright green and just wilted and browned in parts, about 5-8 minutes. 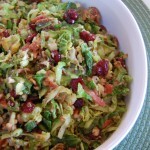 Dress the slaw and add the toasted pecans, bacon and cranberries. Taste and adjust the seasonings as needed. The salad is tasty warm or at room temperature and will keep for a couple of days in the fridge.